FPCR provided the architectural package for a number of reserved matters applications for Persimmon Homes at Burgess Hill, Sussex. 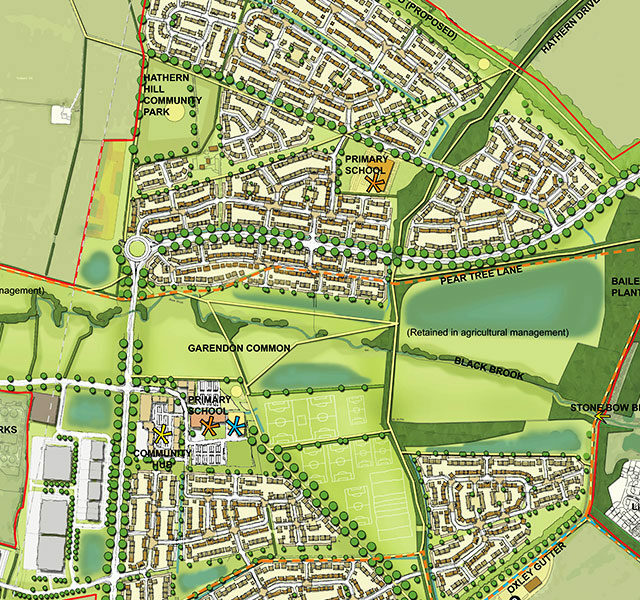 Outline consent for up to 480 dwellings was achieved in 2015. The overall site includes a large number of mature trees and hedgerows, which form the landscape framework for the proposed plots within the site. Phase 2 of the site includes Charles Church and Persimmon residential units. A detailed layout was designed by FPCR that created a number of character areas drawing on the reserved matters applications. Elevations and materials included local materials such as clay hanging tiles and weatherboards. Bespoke three storey apartment blocks were designed as part of the application. All houses conform to the national minimum space standards. Phase 3 includes a local centre and further residential dwellings. Detail layouts were provided for the three storey mixed use local centre, which includes retail units to the ground floor, and affordable units to second and third floors. A healthcare and community facilities building were also detailed with elevational treatment reflecting the local ‘farmstead’ character.